The essentials by OFM seating collection is where quality meets value. 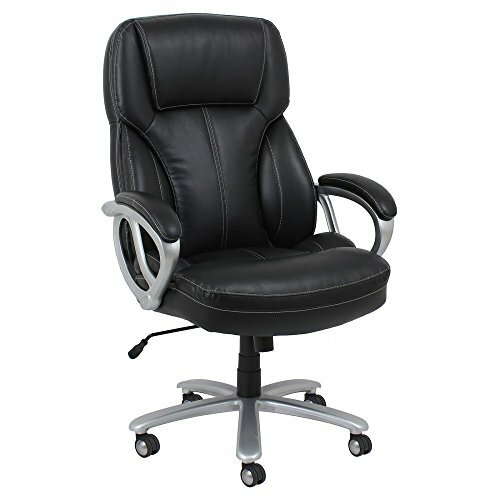 The accessories-202 executive chair is upholstered with soft, deep black bonded leather that is comfortable yet durable, making it a smart and stylish solution to any Application. It features silver Mist accents which provide a contemporary look to complement the leather. It also offers simple and intuitive controls such as gas lift seat Height adjustment, 360 degree swivel, and tilt lock for added customizability and comfort. The padded fixed loop arms add to the unique appeal and provide upper body support. The comfort, stylish look, and price point of this chair make it a perfect addition to the office, whether at work or at home. This ESS-202-BLK-OFM meets or exceeds industry standards for safety and durability, and is backed by our Essentials by OFM limited warranty. If you have any questions about this product by Essentials by OFM, contact us by completing and submitting the form below. If you are looking for a specif part number, please include it with your message.